Location: Northwest of Perpignan, Maury is located in the heart of the Agly Valley, the area is protected by the Corbières mounts to the North and the foothills of the Pyrenées to the South. White varieties: Grenache blanc and Gris ; Macabeu ; Malvoisie du Roussillon ; Muscats d’Alexandrie and Petits Grains. Our Maury is a fortified red wine, just like the well-known and traditional Porto Vintages. Roussillon is the historical birthplace of some of the greatest French fortified wines and Grenache noir is the traditional variety here. Out of 2000 hectares of black soils in the Roussillon, the Grenache noir is planted on almost 80%. Its best expression is smooth, unctuous, delicate and elegant, it shares some red fruits notes (cherry, also prune…). Thus, it also fits well for both fortified wine and dry wine blends. 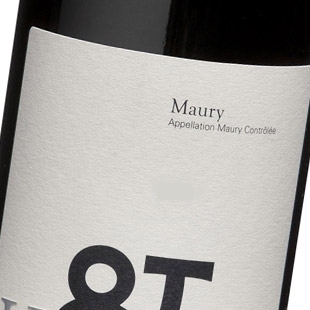 It represents the identity of the Maury wine. 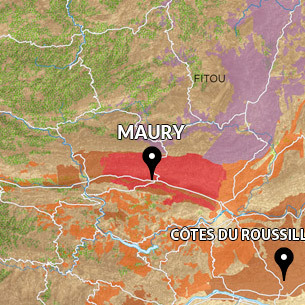 Located in the northern part of the Roussillon, the appellation stretches out on 4 villages: Maury, Saint Paul de Fenouillet to the west, Tautavel to the east and Rasiguieres to the south. The Maury vineyard extends on several hills, mainly composed of black marls and slates. These schisty soils increase the sun benefits because, during the night, they restore the heat stored during the day. The sun is definitely a key factor to produce a great fortified wine. In Maury, we can rely on an average of more than 280 sunny days a year. The vineyard also benefits from a mixed climate, some warm and dry Mediterranean influences are combined with western ones, fresher and wetter. On an annual basis, average temperatures are up 13°c and rainfalls, are between 650 millimeters up to 700. Our Maury is a fortified red wine, just like the well-known and traditional Porto Vintages. Mutage method lies in adding alcohol during alcoholic fermentation to stop it. Obviously, this wine comes from the oldest vines of Grenache noir, planted at the beginning of the twentieth century, surrounding the town of Maury. In this wine we wanted to express the aromatic power of the best Catalan Grenache, the charm and the sweetness of the fortified wine while preserving balance and freshness thanks to the magnificent tanins.